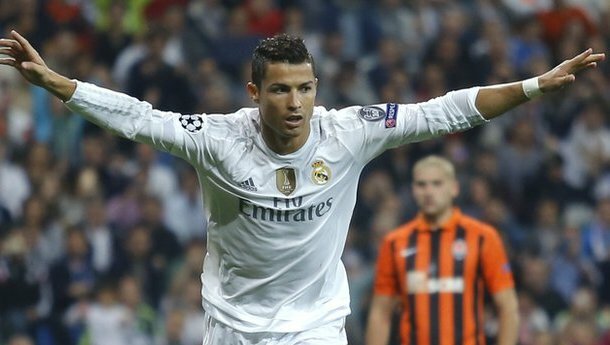 Ronaldo scored a hat-trick during his side’s 4-0 win over Shakhtar Donetsk at the Santiago Bernabeu. Ronaldo who has failed to find the net in Real’s opening two games of the season is now working as goal machine. First he netted five goals in 6-0 win against Espanyol on Saturday and now hit second hat-trick in an emphatic victory over 10-man Shakhtar Donetsk at the Bernabéu on Tuesday. Karim Benzema put Real ahead in the 30th minute and after that it was all Ronaldo’s show that lured the spectators. Despite of lagging behind in goals tally Shakhtar even lost Taras Stepanenko after getting two yellow cards in 50th minute making them more vulnerable. Ronaldo scored his first goal in a dubious penalty conceded by Darijo Srna (Shakhtar Donetsk) with a hand ball in the penalty area. Real made it 3-0 after Ronaldo converted another penalty conceded by Márcio Azevedo (Shakhtar Donetsk) with a hand ball in the penalty area. The show have not ended there it continued with more bookings and substitutions and finally the Portugal international hit his third goal with header and brought the final scoreboard 4-0 in favour of Real. With this Hat-Trick Ronaldo moved three goals ahead of Barcelona superstar Lionel Messi. He is now two goals away from equalling Raul’s record as Madrid’s all-time leading goal-scorer. The match which is a treat for Ronaldo happened to a doom for his team mate Gareth Bale. Bale hobbled off with a calf injury to be replaced by Mateo Kovacic and the extent of the injury so far is unknown. I simply want to mention I am just newbie to blogs and definitely liked your web page. Very likely I’m planning to bookmark your blog post . You surely have superb stories. Appreciate it for revealing your web page. Hiya, I’m really glad I have found this information. Nowadays bloggers publish just about gossip and net stuff and this is actually irritating. A good site with interesting content, that is what I need. Thanks for making this web-site, and I’ll be visiting again. Do you do newsletters by email? Hi. I’m Andy and I’m there to mention thank you plenty for these texts posted. I am truly pleased that someone did it for myself and other people.